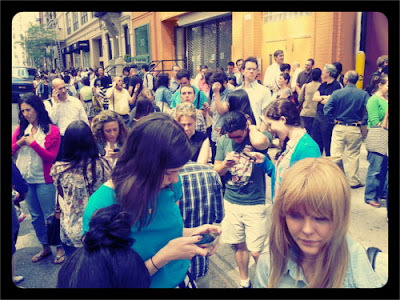 NYC Recession Diary: NYC EARTHQUAKE: Bar, Restaurant and other #QUAKESPECIALS! 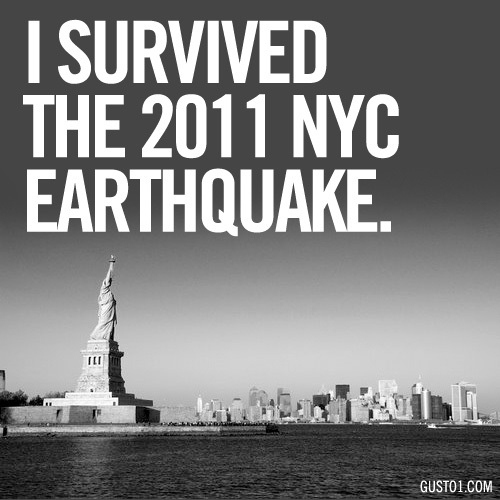 NYC EARTHQUAKE: Bar, Restaurant and other #QUAKESPECIALS! We all felt that - a little rumble in our office buildings some mistook for aggressive typing, until some skimmed their Twitter feed and realized ZOMG, WE'RE IN AN EARTHQUAKE! Second reaction: any earthquake bar specials? YES -- to celebrate our wholistic survival (NYC reported 0 deaths, 0 damage, 0 real sensationalism) bars, restaurants and bakerys across the city are latching on to the newscycle and celebrating with #QUAKESPECIALS! MACERELLERIA: 2-for-1 Ty-Ku Shochu Martinis all night. HOTEL SPECIAL: If you're stuck in NYC due to the earthquake, GansevoortPark has got you covered with a secret deal. Tweet them!